10 Amp / 10A plug top fuse, made to the British Standard BS1362. Length 25.4mm (1 inch), diameter 6.3mm (1/4 inch). 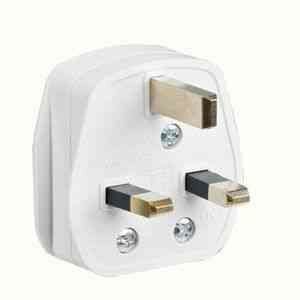 Run two appliances from one 13A socket with this double adaptor. Total load must not exceed 13A. Standard UK 13A plug-top, fitted with 13 Amp fuse. Made to the British Standard BS1363. 13 Amp / 13A plug top fuse (the highest rating fuse that can be fitted to a UK plug top), made to the British Standard BS1362. 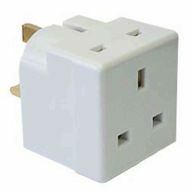 Run three appliances from one plug socket with this treble adaptor. 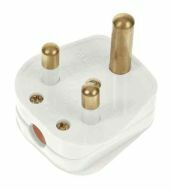 15 Amp / 15A round pin plug top. Used in older UK houses and some industrial applications. Made to the British Standard BS 546. Green colour coded 1 Amp / 1A BS646 fuse. Typically used in clocks and shaver / razor / toothbrush adaptors. 1 Amp / 1A plug top fuse made to the British Standard BS1362. Old style, round pin 2 Amp / 2A plug top. Used in old installations or in special applications such as remotely switched lighting. 3 Amp / 3A plug top fuse, made to the British Standard BS1362. 5 Amp / 5A fuse made to the British Standard BS1362. This fuse is for a standard UK plug top, it is NOT suitable for the lighting circuit in your fusebox. 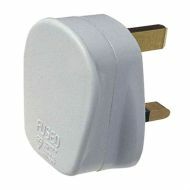 Old style, BS546 round pin 5 Amp / 5A plug top. Used in older electrical installations or in special applications such as remotely switched lighting. 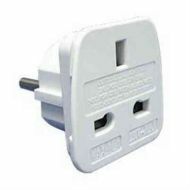 Use your UK electrical items when traveling in Europe. 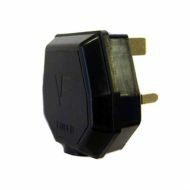 Does not change voltage, though Europe is all 230 Volt, which your UK items are quite happy with.. This heavy duty plug top is a lot stronger than the normal, brittle, 13A plug top. Fitted with 13 Amp fuse. 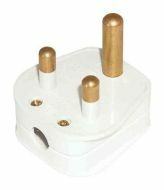 Plug the adaptor into a 13A socket and then plug your appliance or extension lead into the adaptor. Gives added protection against the risk of electrocution, particularly suitable for hedge trimmers, lawnmowers and other outdoor power tools. 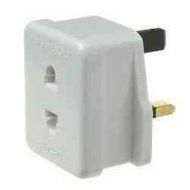 13A UK three pin plug at the front, 2 pin socket at the back. Fused at 1A - designed for use with electric shavers and toothbrushes, not suitable for heavy loads (like domestic appliances). We keep BS646 spare fuses, if you need them. 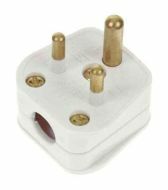 This fused adaptor enables electrical items with foreign plugs to be used in the UK. 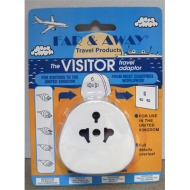 DOES NOT transform voltage, check your foreign item can run off 230 Volts before use.